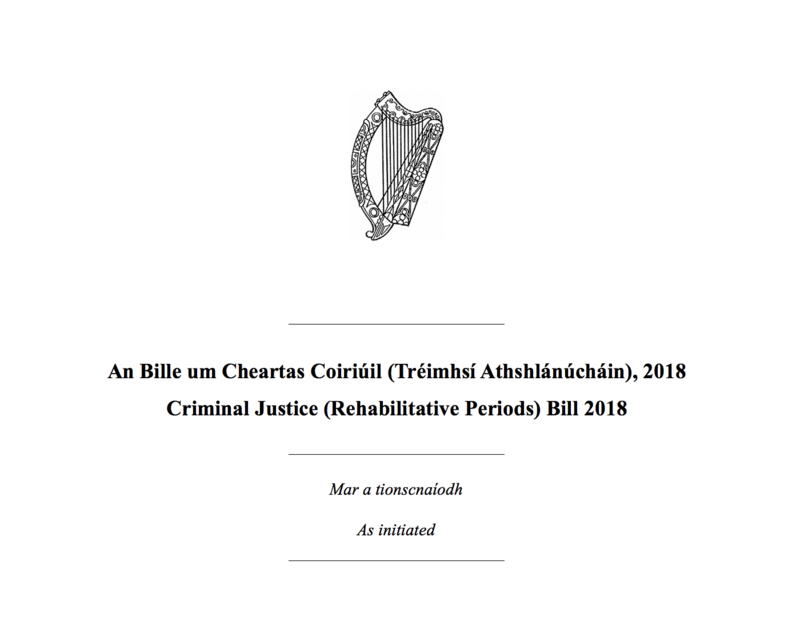 The Criminal Justice (Rehabilitative Periods) Bill 2018 will be debated in Seanad Éireann on February 13th. In order for the bill to pass to the next stage and get one step closer to reforming Ireland’s limited spent convictions regime, we need the support of political parties and independent senators. The political parties represented in the Seanad are Fine Gael, Fianna Fáil, Sinn Féin, the Labour Party and the Green Party along with fifteen independent senators. The easiest way to contact a senator directly is via email (firstname.lastname@oireachtas.ie) or you can email them all at once (senators@oireachtas.ie). You can also lobby the Minister for Justice and Equality who will be deciding whether the Government will let the bill pass to the next stage (minister@justice.ie or charles.flanagan@oireachtas.ie). I’m writing to ask you to support the Criminal Justice (Rehabilitative Periods) Bill 2018 which is being brought forward for its first debate in the Seanad by Senator Lynn Ruane on February 13th. The bill would expand fairer access to spent convictions and help people rehabilitate following a conviction for a minor offense because when a conviction becomes spent, you do not have to disclose it when applying for a job, returning to education or when being Garda vetted. A fair and accessible spent conviction regime encourages and empowers people to leave criminal pasts behind and incentivises and rewards those who demonstrate a capacity for change. The opportunity for a second chance and to leave a criminal record behind in the past is key to reducing recidivism and promoting social cohesion, as we all benefit from the reintegration and contribution of those with former convictions. Ireland has had a spent convictions regime since 2016 but it is very limited, both in practice and comparatively with other European countries. Only one conviction of up until 12 months in length can ever become spent and the time period before it becomes spent, or the rehabilitative period, is set at a blanket 7 years for all sentences, without accounting for the individual’s circumstances. This bill will make four major changes to make access to spent convictions broader and fairer. It will expand eligible sentences to be spent from 12 months up until 24 months. 24 months is much closer to the European average and allows for more people to rehabilitate. It increases the limit on convictions that may be spent from one to two. It makes the rehabilitative period until the conviction become spent proportional to the length of the sentence. It makes account for the additional rehabilitative needs of young people by giving them an extra opportunity for a spent conviction and proportionally shorter rehabilitative periods. This a modest but important step towards giving people a fairer opportunity at a second chance after a conviction and to move us more in line with European norms. I hope you can give the bill your support; I look forward to hearing from you. Good luck! Please get in touch if you have any queries.